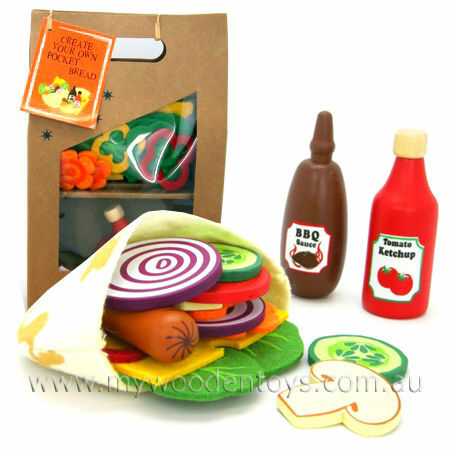 Play Food Felt & Wood Pocket Bread is a beautiful wooden and felt toy that all goes together to make a delicious pretend pocket bread. This set comes with a felt pita bread pocket and wooden veggie slices which include onion, cucumber and tomato. There are also felt pieces which include lettuce and cheese . There is also a wooden sausage and 2 bottles of sauce. This set is beautifully presented in a heavy duty cardboard bag. A marvelous roleplay toy and being able to stuff things into the bread pocket is very satisfying. Material: Wood Child-safe paint, Paper, Felt. We like this because: "Great way to learn food names."